Applications are invited for a PhD Scholarship being offered by the School of Law, University of Glasgow, in collaboration with international law firm CMS. The PhD project will involve a unique collaboration between the technology, media and communications practice of CMS (led by Chris Watson), and the RCUK CREATe Centre, investigating copyright and digital innovation (led by Prof. Martin Kretschmer) who will jointly supervise. The PhD project will be shaped in discussion with the successful candidate, and seeks to establish thought leadership in a cutting edge area relating to digital technology, competition and innovation. We are particularly interested in emerging technologies and structures that may be linked to a new understanding of data as a source of market power. However, other topics could also be considered, for example relating to the Internet of Things, cloud computing, patent and trade mark behaviour (e.g. in the smartphone market), liability of intermediaries, distributed ledger technology, user-led innovation or platform competition. There will be opportunities to benefit from access to CMS’ extensive international network of clients and institutional contacts as part of the PhD research, including a possible internship. Home/EU applicants are eligible to apply; however only full-time students will be considered. The work of CREATe is interdisciplinary. Supervisory expertise and training is available to support a PhD project that includes an empirical component. Two References: References should be on official headed notepaper and signed by referees; references given to candidates in sealed envelopes should be opened, scanned and attached to the email. A Research Proposal. The Proposal should be no longer than 1500 words, excluding references etc, and should include a Statement on how the Research Proposal may establish thought leadership. Additional items such as references and bibliography should be attached on the application email separately from the research proposal – i.e. on a separate document. Applicants are encouraged to include one sample of their academic writing. Please make sure to cite the appropriate reference (CMS CREATe) in the subject line of your email. Please note that all documents submitted should be named according to the following standard: “Scholarship Reference_Applicant Name_Document Name”. For example: “CMS CREATe_George McCarthy_CV” or “WP1B2_George McCarthy_Reference 1”. 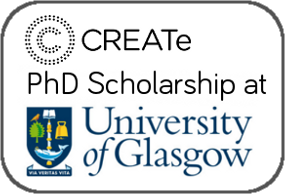 Applicants will be evaluated by a selection panel, including Prof. Martin Kretschmer (Director of CREATe, School of Law, University of Glasgow) and Chris Watson (CMS). The selection panel will base its decision on the applicant’s academic qualifications, the quality of the Research Proposal and Research Statement, references, and may take into account any other factor which it considers relevant. Following a process of shortlisting, candidates will be invited to attend an interview. In-person interviews are preferred, but where this is impractical the arrangement of telephone or Skype interviews will be considered. The School of Law reserves the right to make an offer of a scholarship subject to a research proposal being revised in such manner as it sees fit, or to any other conditions, or to make no award. If you wish to discuss further details, please contact Prof. Martin Kretschmer (Martin.Kretschmer[at]glasgow.ac.uk). This entry was posted in CREATe Blog, Opportunities and tagged opportunity. Bookmark the permalink.